Whether you’ve been pregnant before or not, it can feel like your body is suddenly put under a microscope. You may be wondering why your teeth are relevant at all when it comes to pregnancy concerns. The thing is, the hormonal changes that hit your body during pregnancy can affect your dental health. Having the help of a dental professional can make your pregnancy that much smoother. At Smile Designers, we have dedicated ourselves to helping women keep their teeth healthy throughout their pregnancies. We provide excellent, compassionate care as well as educational material that empowers our patients to make healthy decisions with confidence. The following list is an outline of what to keep in mind before, during, and after pregnancy. If you can, it best to go into pregnancy with a clean bill of dental health. Whether you’re able to make an appointment before you become pregnant or not, it’s a good idea to go in for a checkup and cleaning. That way, your dentist can examine your teeth and gums for issues. If you see your dentist regularly, you’re in really great shape because issues can be solved before they get too far. Make sure your dentist knows that you’re pregnant. The good news is, your dental care doesn’t necessarily have to change. Routine care can be performed at any time. The same goes for urgent procedures. The main exception is elective procedures, which should be put off until after your delivery. Keep your obstetrician in the loop about your dental appointments just in case there are special instructions or precautions for you. 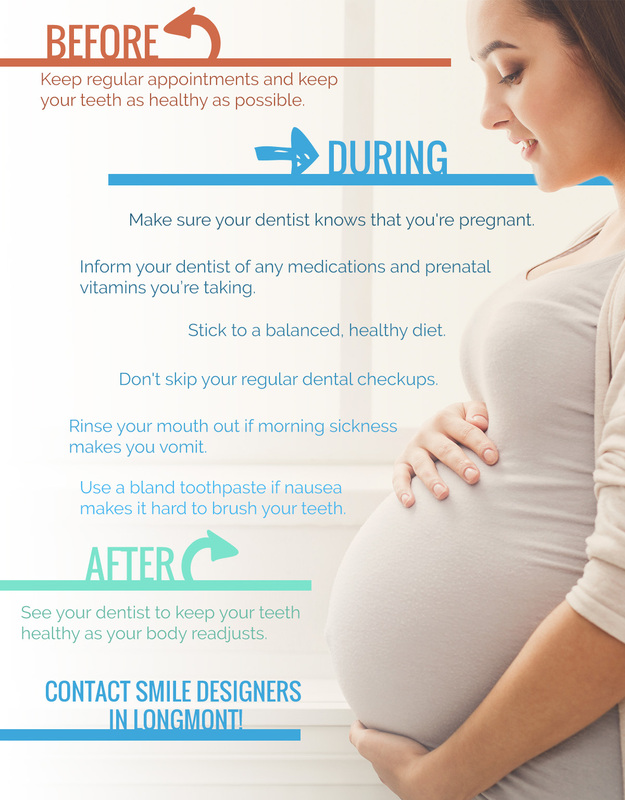 Don’t skip your dental appointments because you’re pregnant. 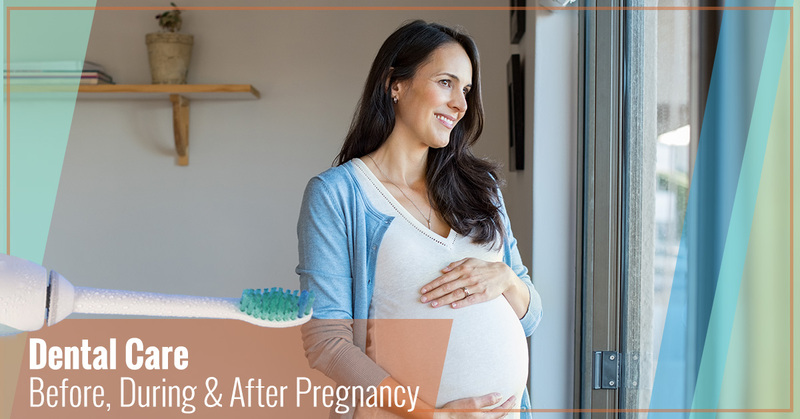 Dental care becomes especially important during pregnancy because pregnancy causes hormonal changes that increase your risk for periodontal disease. Additionally, pregnancy can cause “pregnancy gingivitis,” a condition in which your gums become tender and bleed easily. In general, x-rays should be avoided during pregnancy. However, dental x-rays can be taken if they are absolutely necessary, especially because x-rays have come a long way and become a lot safer. The dentist will need to be careful to protect you and your baby, using shields to cover your thyroid and abdomen. Make sure your dentist knows about the drugs you take, including prenatal vitamins and medications. The dentist should also know if your doctor has given you any special instructions or medical advice. That way, your dentist can alter your treatment if necessary. Stick to a balanced, healthy diet. You really are “eating for two people,” not only sustaining your own health but also providing your baby with building blocks for development. When it’s time for a snack, do your best to avoid sugary options. While it is common to crave sugar during pregnancy, keep things moderate. Otherwise, the sugar will increase your vulnerability for tooth decay. Sometimes, morning sickness can make brushing your teeth almost impossible. The good news is, you can brush with a bland toothpaste to make everything easier. Your dentist or hygienist will be able to recommend some brands to you. If morning sickness causes you to vomit often, rinse your mouth out with water or a special rinse. This will prevent the acidity from breaking down your teeth. Get your dental health evaluated after delivery, especially if you experienced gum issues during the pregnancy. Keep your regular appointments going after that. At Smile Designers, we are proud to be able to help the families of Longmont by providing world-class dental care. Call our welcoming dental office for an appointment today!